Situated in a national park, this ryokan is 0.2 mi (0.3 km) from Urinating Boy of Iya Ravine and within 9 mi (15 km) of Iya Kazurabashi Bridge and Heike Yashiki Museum of Folklore. 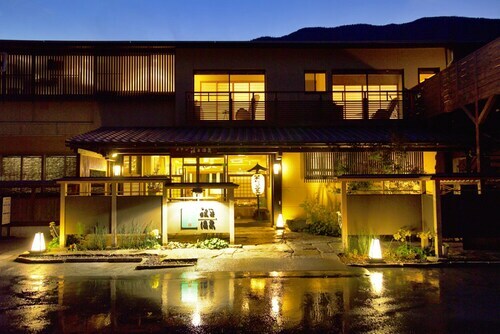 Situated in Miyoshi, this ryokan is steps from Setonaikai National Park and Oboke Gorge. Iya Valley and Iya Kazurabashi are also within 2 mi (3 km). 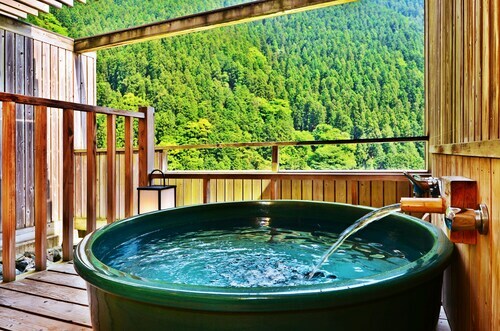 Located in Konpira Onsen, this ryokan is within 1 mi (2 km) of New Reoma World and Kotohira-gu. Kanamaruza Kabuki Theater and Konpira Shrine are also within 5 minutes. How Much is a Hotel Room in Tsurugi? Hotels in Tsurugi start at $41 per night. Prices and availability subject to change. Additional terms may apply. Savvy travelers can find 8 hotels within a 19 miles (30 kilometers) drive of Tsurugi through Travelocity's extensive hotel hotels page. 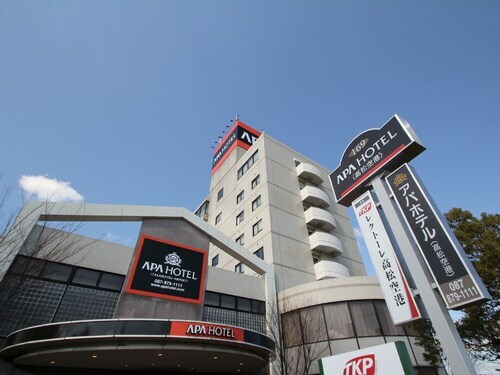 The closest Travelocity-listed accommodation is the APA Hotel Takamatsu Airport, Kagawa, situated 18 miles (29 kilometers) from the urban core of Tsurugi. Instead, you could have a look at the Hotel Iyaonsen, located in Osaka, which is 14 miles (22 kilometers) from the downtown area. It's worth having a look at the Yumoto Konpira Onsen Hananoyu Koubaitei and also the Kotohira River Side Hotel. The Yumoto Konpira Onsen Hananoyu Koubaitei is situated just 20 miles (33 kilometers) outside of the middle of Tsurugi. The Kotohira River Side Hotel, can be found just 20 miles (33 kilometers) away. 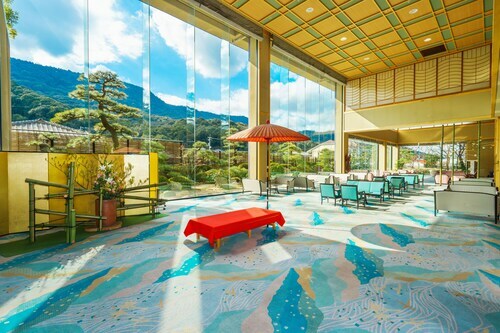 Two other Travelocity-listed places to stay in the Tsurugi area include the Kotohira Grand Hotel Sakuranosho along with the Kotohira Kadan. If you have time, adventurous travelers could discover the other scenic and cultural delights of Shikoku. Shikoku is marked by rural landscapes, and commonly visited visitor destinations include castles and traditional villages. In this area of Japan adventurous travelers can also try their hand at mountain climbing, hiking and cycling. Looking for more things to do? You could spend some time checking out Awa Odori Kaikan and Tokushima Castle, which you'll find in Tokushima, 30 miles (49 kilometers) east of Tsurugi. Some Tokushima hotel options include the Tokushima Tokyu REI Hotel and Tokushima Grandvrio Hotel. 30 miles (45 kilometers) to the north of Tsurugi, you can find Sakaide, which is home to the Hotel Route-Inn Sakaidekita Inter and Kyukamura Sanuki-Goshikidai. The Tsuzumioka Shrine and Koshointenno-ji Temple are some of the more frequented points of interest to visit when in Sakaide. Just because you and your traveling partners are taking a break from your usual habits, shouldn't mean you can't fuel your love of stadium sports. Kanko Stadium is 50 miles (81 kilometers) to the north of Tsurugi. And travelers that wish to find Travelocity-listed hotels in the area around the stadium should look at the Okayama Royal Hotel or the Hotel Granvia Okayama. Travelocity's comprehensive travel guide is also a fantastic way to learn locals tips for Tsurugi.